Manual handling, sometimes called material handling, is any activity where a person pushes, pulls, carries, lifts or restrains an object or person. Manual handling is the source of many work-place injuries, such as back pain, neck pain and muscle tears. Injuries related to manual handling can be prevented using a few rules. Rules for smart manual handling. 1. Think first and prepare. 2. Keep your spine neutral. 3. Hold the load close to your body. Do I really need to move this object? Is there an alternative such as a mechanical aid (trolleys, forklifts, conveyors)? What does the object weigh? Is the weight evenly distributed? Can I split up the load? Am I capable of moving the object without causing an injury given my general fitness, fatigue levels and past experience? How will I grip the object? Do I need gloves? Should I ask for help? What do I need to do to my environment before I complete the task? Is the path clear? Is there a place ready to move the object to? This rule is most often forgotten, yet it is the most important. Thinking only takes a minute. Your spine is more susceptible to injury when it is flexed. The neutral curve of your spine should be maintained during any manual handling. For most people, their spine is in "neutral" when there is a slight arch in the lower spine, and a slightly rounded upper back. When you flex your spine greater pressure is placed on the discs between each vertebrae and the discs can become injured. 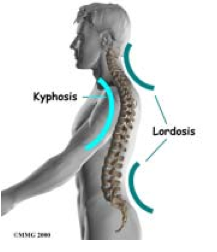 When then spine is held in the neutral position, the strong stabilizing muscles of the back and abdomen are able to support the spine and reduce pressure on the discs during manual handling. 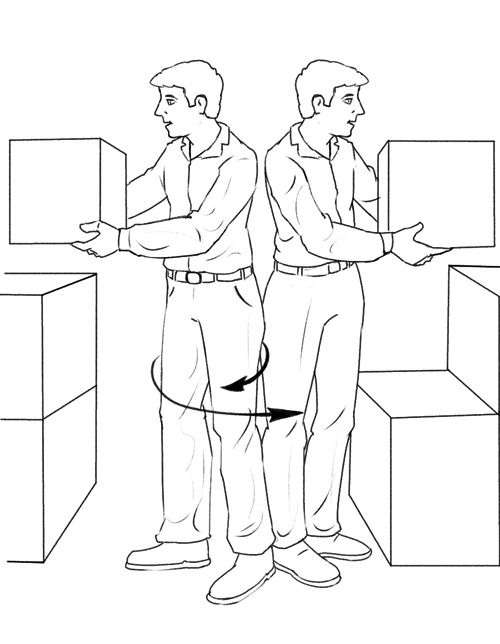 In order to keep your spine neutral when lifting, you may need to bend your knees to reach the object to be moved. Your large knee joints and big leg muscles are much better suited to manual handling than the smaller joints and muscles around your spine. Holding the load close to your body reduces the demand on your muscles to support and move the load. Even holding a relatively light object can seem difficult if you are holding it with outstretched arms. When you twist your spine the small muscles and ligaments close to the spine become stretched. This reduces their ability to support the spine and increases the risk of injury if a load is applied while your muscles and ligaments are stretched. Move your feet to point in the direction you are going, rather than twist your spine. How The Therapy Center can help. The basic rules above are kept simple so that they are easy to remember when you are actually in the workplace. There are some important individual factors that can also help prevent injuries from manual handling. Your personal fitness level, level of alertness, and physical training for a task can all impact on your risk of injury. Having strong abdominal and back muscles and knowing how to use them correctly during manual handling is a great advantage. Some forms of regular exercise such as swimming and walking help to keep the abdominal and back muscles strong. 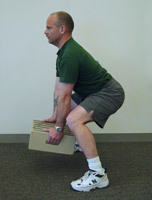 At The Therapy Center, we can assess your technique for manual handling and can correct your lifting posture if required. We can also design you a program to improve your abdominal and back muscle control during manual handling. Using your deep abdominal muscles can be difficult at first, but we can help you find those muscles and can teach you how to use them at the right time.